Hotels in Dubai - Deira Dubai Hotels and Deira Dubai Resorts UAE with huge discount guaranteed! A modern, luxury hotel, Hyatt Regency Dubai is a cool and welcoming oasis in the heart of Dubai that reflects the legendary traditions of Arabian hospitality. The hotel is located on the Deira Corniche, overlooking the Persian Gulf at the mouth of Dubai Creek, and is within walking distance of the gold souk, only two minutes from the commercial and shopping areas and just 15 minutes from Dubai International Airport and the Dubai World Trade Centre. Breathtaking views of the Persian Gulf are a feature of each of the hotel's 400 spacious guest rooms and suites, each beautifully designed and offering contemporary luxury. Long-stay guests at Hyatt Regency Dubai enjoy the convenience of the Galleria Residence, with its convenient access to shopping and entertainment facilities. The hotel's superb facilities include Hyatt's Club Olympus, with a state-of-the art fitness centre, swimming pool, squash and tennis courts and spa. A cinema complex, ice rink and golf pitch and putt course are additional facilities available at the hotel together with Hyatt's fully comprehensive Business Centre for the convenience of business travellers. Fine dining goes hand-in-hand with a stay at Hyatt Regency Dubai where the choice of worldwide cuisine is available in the hotel's four outstanding restaurants, ranging from European and Japanese to Persian and international. Together with an array of bars, the hotel also has a discotheque and karaoke lounge. The perfect venue for meetings and banquets in Dubai, Hyatt Regency Dubai has a selection of eight flexible function rooms that includes the hotel's superb Crystal Ballroom, which can house up to 1200 people and can be divided for smaller gatherings, whether for conferences, exhibitions, weddings or boardroom meetings. 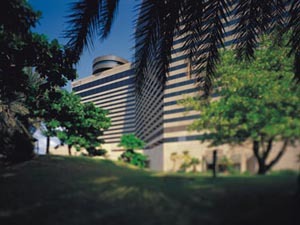 A first-class hotel with Hyatt's unique blend of luxury and service, Hyatt Regency Dubai!